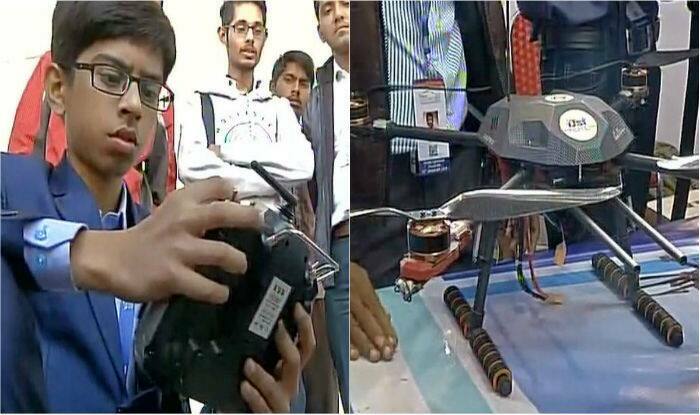 Harshwardhan Zala is a 14-year-old boy who has created a drone that could be capable of the detection and defusion of landmines in the war fields. He is currently studying in Std X and just signed a deal of 5 crores with Indian government so that he can explore those further possibilities of its commercial productions. He signed this MOU at the recently concluding Vibrant Gujarat summit in Ahmedabad. This 14 years old boy is not just a Drone maker but also an avid coder, tinkerer and an evolving entrepreneur also. His first creation was based on a Home automation system that could be controlled by any typical home-based television remote controller. Harshwardhan was born in Ahmedabad (Gujarat, India) to an accountant father and businesswomen. His father is working as a senior accountant in Vishal Plast Industries situated in Ahmedabad and his mother is a businesswoman who deals with sarees and bangles. He is studying in Class X at Sarvoday Vidhyamandir of Ahmedabad. He started to work in the landmine project since 2016 after reading about a heavy casualty of Indian army due to landmines. Since there he decided to build the drone. He told news reporters that ""I first created a land mine detecting robot but realised that since the weight is heavy it would trigger a blast and damage it so I thought of creating a drone which will be at a safe distance while detecting the mines". He also said that "once the mine was detected by the drone through an infrared sensor, a 50 grams detonator will complete the task of defusing it. For the final prototype that I created it cost me around 3.2 lakhs and improving it further may increase the cost a little but it will be still cheaper than the present system which is used in the army". As per the statement of Dr Narottam Sahu, head of Gujarat Council on Science and Technology (GUJCOST), Harshwardhan will soon be working with the Gujarat government soon on his drone project.